For administration of radioactive iodine for the treatment of differentiated cancer thyroid patients, activities ranging between 1.85 GBq and 7.0 GBq are used. Hospital local safety guidelines stipulate isolation of patients till their radioactive burden reduces to a level <10 μSv/h at 1 m. The construction of concrete rooms gets clearance by national regulatory authorities. The regulatory bodies normally do not recommend the presence of windows on the barrier walls., If any windows are provided, it shall have lead equivalence equal to that of the barrier concrete wall, and the side fittings shall have radiation leak proof collars. Centralized air conditioning with filters is incorporated in the design. Our experience over a decade showed that many patients have phobia to stay in isolation rooms for >3 days; and hence, many did not take the treatments. A necessity was felt to introduce glass window on the opposite, back side wall of entrance door, which had a service corridor with restricted entry, opening toward the garden area. We outline the measurements undertaken to document the adequacy of radiation protection offered by the lead glass window. Commercially available lead glass used for X-ray computed tomography (CT) scanner of size 1380 mm × 620 mm, of physical thickness 8.5 mm (2 mm Pb Equivalent) was fixed on the 0.35 m thick concrete wall in both the rooms as viewing window (VW) [Figure 1]. The adequacy of protection offered by the lead glass was determined using a 600 MBq I-131 capsule moved at a distance 50 cm away parallel from the wall inside the room and measuring transmission outside the room. “An end window beta-gamma (Inovision, Model 190) handheld autoranging wide range survey meter with 'pancake end window Geiger Műller (GM) detector' having μR/h and counts per min” sensitive mode was used. The readings were converted to SI units later (in μSv/h). The uncertainty of measurements with this survey instrument was within ± 15%. Measurements were performed at the middle-level height of the lead glass (on the outer side of the glass), on the edge of the wall. 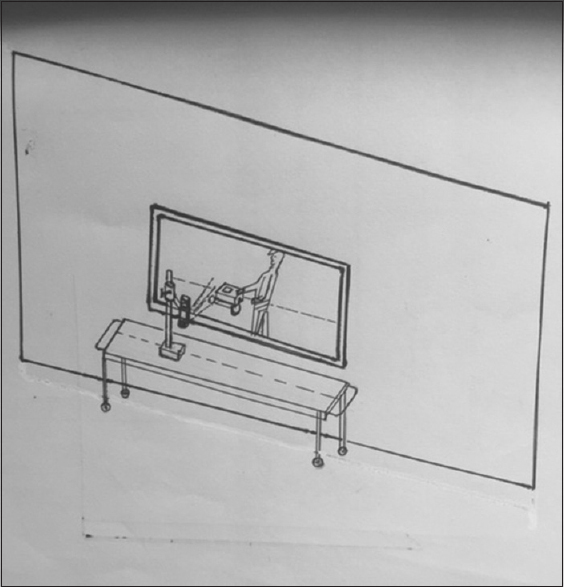 Measurements were carried as a profile at 15 cm intervals up to 90 cm either sides of the midpoint, so as to go beyond both sides of 138 cm lead glass (glass part 69 cm either side). [Figure 2] shows the geometry of the measurements carried out. One set of measurements along the edge of the wall below the glass window, along the concrete wall. Another set of measurements along the midline of the VW outside. Background reading of survey meter without radioactive source 10.5 μR/h. The measured values were normalized for 3.7 GBq at 2 m bed position in μSv/h. The survey meter measured transmission with 600 MBq activity for the two rooms across the middle level of lead glass is shown in [Table 1]. From [Table 1], the maximum exposure rate recorded for Room 1 and Room 2 was 0.58 mR/h and 0.87 mR/h, respectively. 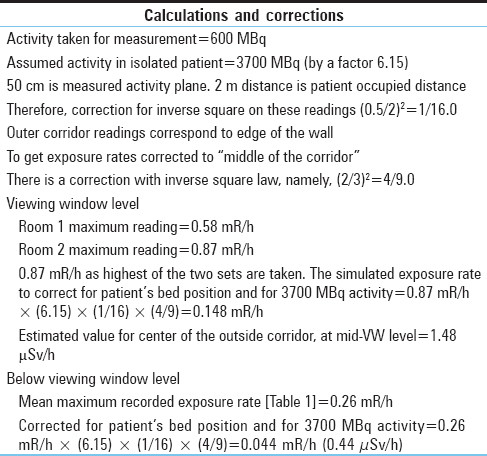 As shown in [Table 2], the estimated exposure rate for 3.7 GBq of administered activity in the outer corridor in the middle VW level (by calculation) was 1.48 μSv/h. Below the window level, the estimated exposure rate was 0.44 μSv/h. As the estimates of exposure rates assumed that full activity of 3.7 GBq is all the times present, correction for effective halftime of clearance and also patients' self-shielding to the administrated activity needs to be accounted. [Table 3] summarizes the true estimates for one patient for a stay of 3 days with progressively decreasing activity. Therefore, the realistic exposure rate derived in this study is 0.74 μSv/h after fixing of VW. This work has brought out our experience in installing a VW which is commercially available for CT scanner room installation. Separate lead equivalence at 364 KeV photons is not specified in literature, as at this energy there is less of photoelectric effect. As there are no reports about such facility for isolation rooms, this report may be of value in health physics literature. The patients' acceptance for I-131 administration was better after they visit and see the presence of window in these isolation rooms. The isolation rooms were handed over back after the present modification, with recommendations (a) to have a cloth screen on the window inside the room for patient's privacy and (b) to have a caution radioactive sign abstaining use of the service corridor by patients and relatives unless there is an emergency. A report was submitted to the Radiation Safety Expert of the Ministry of Health, Sultanate of Oman, regarding the efficacy of radiation protection offered by this VW. 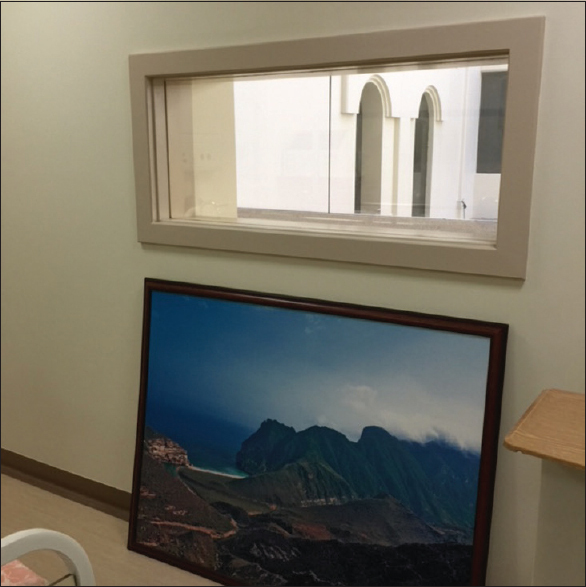 The provision of viewing window in two isolation rooms has helped in improving the ambience for patients under treatment. This precedence will help architects to plan lead glass window in I-131 isolation rooms. Soman SD, Venkateswaran TV. Radiological Protection Aspects of Radioiodine Therapy for Cancer of the Thyroid. Proc. Of Seminar. Bombay, BARC, Mumbai. March, 4-6; 1985. AERB Safety Code for Nuclear Medicine Laboratories. (SC/MED 4), Atomic Energy Regulatory Board. Mumbai: Govt of India Publications; 1989. Ravichandran R, Arunkumar LS, Sreeram R, Gorman K, Al Saadi A. Design, function and radiation safety aspects of delay tank system connected to radioactive iodine isolation wards at oncology centre, Oman. J Med Phys 2006;31:156-7. Ravichandran R, Binukumar J. Development of departmental standard for traceability of measured activity for I-131 therapy capsules used in nuclear medicine. J Med Phys 2011;36:46-50. Ravichandran R, Binukumar JP, Sreeram R, Arunkumar LS. An overview of radioactive waste disposal procedures of a nuclear medicine department. J Med Phys 2011;36:95-9. Ravichandran R, Al Saadi A, Al Balushi N. Radioactive body burden measurements in (131) iodine therapy for differentiated thyroid cancer: Effect of recombinant thyroid stimulating hormone in whole body (131)iodine clearance. World J Nucl Med 2014;13:56-61. Ravichandran R, Al Balushi N. Radioactive(131) Iodine body burden and blood dose estimates in treatment for differentiated thyroid cancer by external probe counting. World J Nucl Med 2016;15:153-60. Al Aamri M, Ravichandran R, Binukumar JP, Al Balushi N. Therapeutic applications of radioactive (131)iodine: Procedures and incidents with capsules. Indian J Nucl Med 2016;31:176-8.